Though the outdoor farmers market season (here in the Chicago area) is coming to a close within the next month there is something that has just been making an appearance these past few weeks, the Asian Pear. And one grower in particular we don’t see at the markets until this time of year: Oriana’s Oriental Orchard & Nursery. 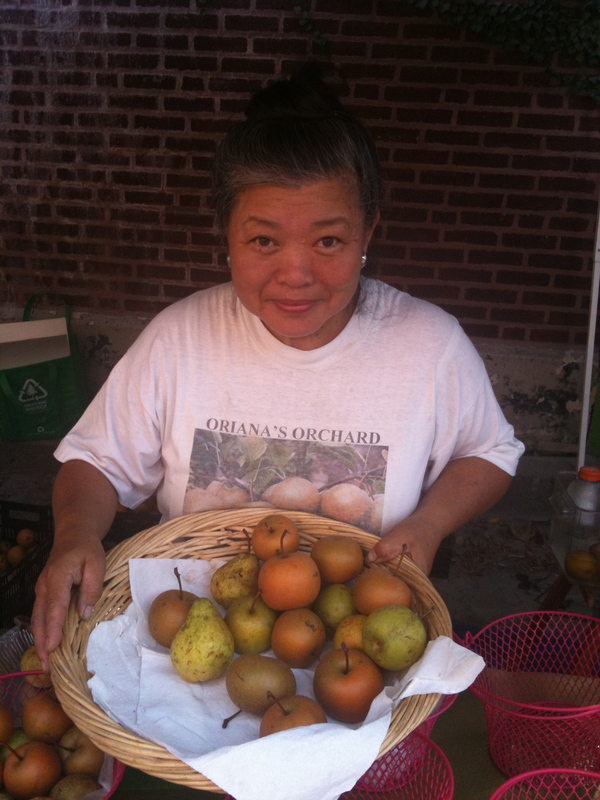 Since Oriana is basically a one-woman show, from tending to and harvesting her orchards of Asian Pears, PawPaws (hello Midwestern Mango! hum, another post altogether), Persimmons, Shiso (yeah, I ain’t the only one), and her coveted Black Walnuts, and selling at the farmers markets she can only be found at a handful of markets: Green City (both Wednesday & Saturday), Glenwood Sunday Market, Andersonville Wednesday Market, and the Botanic Garden’s Farmers Market. 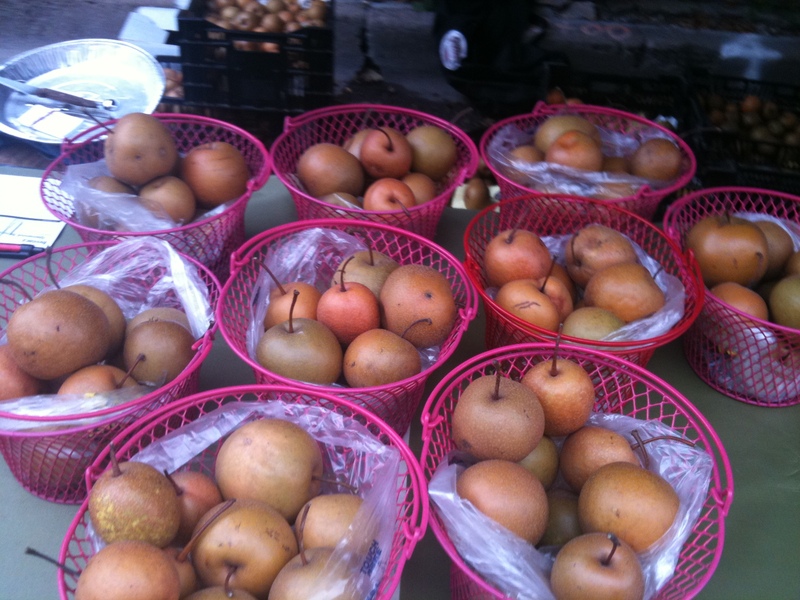 If you get a chance to get to one of these markets you have to get your hands on Oriana’s pears. Not only will she give you samples but quite an education on Asian pears and her cultivation of them. This woman is passionate about the pears and that passion is apparent when you bite into one of her pears. Now, you can find ginormous, and perfect looking asian pears at produce markets and grocery stores, but perfection does not equal the flavor or Oriana’s pears. Perfectly crisp, with a bit of grain (as opposed to the buttery texture of a regular pear), and so juicy and flavorful. And each variety of Asian pear has it’s own flavor, one even tastes a bit like bubble gum, not kidding. Now I have played with cooking the asian pears: roasting, making sauce, added to cobblers, pies and jams but have to say, best as is. Not that an asian pear isn’t fantastic in all these cooked forms, but just eaten on it’s own, or sliced with some cheese, or into a salad, is truly the best way to enjoy. 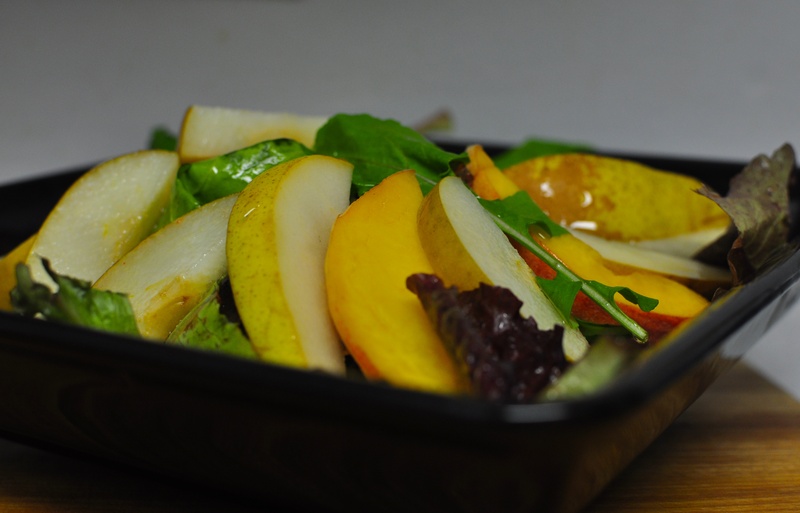 I have been enjoying in a number of salads the past week but a fellow farmers market junkie pal-o-mine created the most beautiful market salad last nite featuring one of Oriana’s pears I just had to share with you. Mix greens together. Then divide greens among 2-4 plates (hey up to you if this is a side or entree salad). Slice pears and peach nice and thin. Arrange fruit on top of the greens. Drizzle with the Honey-Balsamic Vinegar. Per-Fec-Tion. P.S. 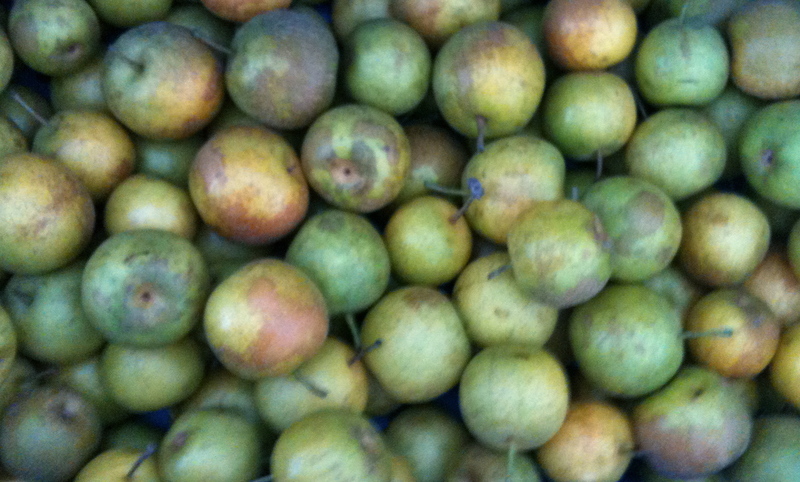 If you can’t track down Oriana, Nichols Farm has some pretty tasty Asian Pears as well. Keep me posted if you know of any other market vendors featuring Asian Pears. P.S.S. Just announced. Lincoln Square Thursday Evening Farmers Market is extending their outdoor season thru the end of October. And even bigger news, after a successful first season, the Glenwood Sunday Market will continue through the winter! After this month they will move indoors (location still TBA) and be held on the 2nd Sunday of the month. This entry was posted in Uncategorized and tagged Andersonville Farmers Market, Asian Pear, Chicago Area farmers marekts, Chicago Farmer's Markets, Evanston Farmer's Market, Farmers Markets, fresh organic, fresh seasonal organic produce, Glenwood Sunday Market, Green City Market, moira's blog, Nichols Farm, Old Town Olive Oil, Oriana's Oriental Orchard, to market with mo. Bookmark the permalink.